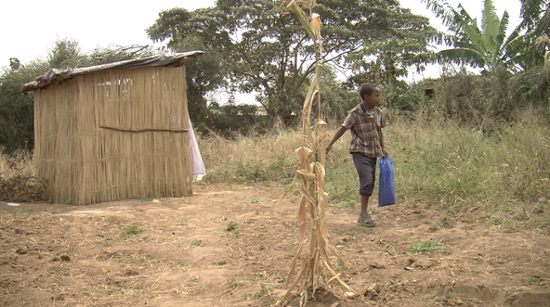 A young boy leaves his home that he helped build at the Nakivale Refugee Camp. 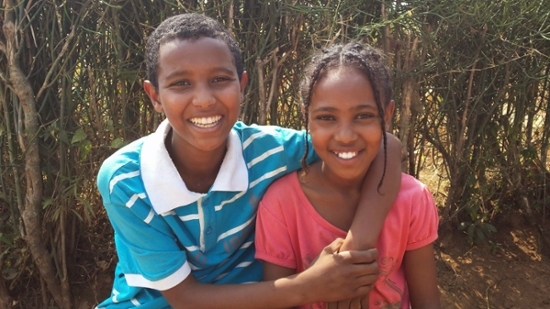 In her first blog entry, Winta set out on the President's Summer Fellowship journey, travelling to Uganda to interview Eritrean refugees for a documentary, and reuniting with members of her family along the way. In this installment, she travels to a nearby refugee camp for her project. When my brother agreed to drive me to Nakivale Refugee Camp, which is five hours away from Kampala, I assumed he knew how to get there. A few hours before we were set to depart, however, I noticed his apprehension. That’s when I found out he had never actually driven there himself. As I begin to rethink my plans he assured me that there was only one road in that direction, which meant there was no possible way to get lost. We decided to travel through the night, so we could arrive there early in the morning. Though I expected unpaved roads and minimal traffic lights, I was completely unprepared for the overwhelming darkness that threatened to swallow us into the wilderness. For most of the ride, it was so dark that my brother and I could not see each other in the car. I couldn’t help but think about how we were completely on our own, with no way to call for help if necessary. Once at Nakivale, I was given a United Nations High Commissioner for Refugees (UNHCR) representative who was charged with following me around all day to make sure I only captured “approved” areas of the camp. In Nakivale, the refugees are separated by their countries of origin and are then required to elect representatives who will speak for them in official camp capacities and help resolve disputes that arise. Thus, my morning began with a town-hall style meeting in which I had to introduce myself and describe the purpose of my visit. As soon as I started speaking in Tigrinya, the native Eritrean language, the whole room seemed to relax. The UNHCR rep required me to translate everything that was said at the meeting. Interestingly, within the first five minutes, a few people asked me not to translate before telling me that they never get the chance to meet with the representatives face to face; thus, they wanted to use this opportunity to air their grievances and share their concerns about the camp. This caused a spirited argument because the elders wanted to respect me as their guest, which to them meant only focusing on the purpose of my visit while I was there. I wanted to honor this opportunity they had to meet with someone from the head office, so the first half of the 1.5-hour meeting was spent talking to the representative. From that conversation several concerning things struck me: even the elected leader of the group didn’t speak English well, which made it difficult to communicate with the UNHCR representative; the refugees at the camp were different than those I’d met in Kampala because they had absolutely nobody to support them; and the set-up of the camp (which is the biggest in Uganda) is terribly suited to handle Eritrean refugees. For example, each refugee at Nakivale is given a plot of land so they may plant and grow their own food. The problem is that refugees from neighboring countries come from agricultural economies, so they are used to working with the land. Many Eritrean refugees, however, have little experience with farming and are often unable to sustain themselves since each person is just expected to figure it out on their own. The problem with this answer is that Eritreans cannot return to Eritrea because they would be instantly killed or arrested, and the Ugandan government has not approved of integration efforts, which means they can’t even get work permits in the country. They are then told that their only other option, resettlement, is not a right.